Where does the “coreKernC(O)RE” model come from? One of my roles is to help people to take sth. onetw. übernehmentake on leadership positions. And reflecting on the challenges of the people I work with, I see some who to make ites schaffenmake it and some who don’t reach their career goals. The people who make it tend to have a combination of these four dimensions. Do you start with competence because it’s the most important element? In a way, yes. It’s the boring one. We all know that you need to be good at what you do. It’s very rare that you are bad at what you do and you still get to the top, like Leonardo DiCaprio in the film Catch Me If You Can. For most of us, competence matters a great deal. The problem is that many people believe that competence is enough, and it’s not. At a certain point in your career, it becomes less about you and more about other people. You can to do the maths (UK)Berechnungen anstellendo the maths. If you perform at 150 per cent all the time, when you come to lead a team of four people, and they all perform at 100 per cent, then you have 150 + 400, which is 550 per cent. But consider the team leader who delivers 100 per cent and inspires his team to deliver 150 per cent each. Then you have 100 + 600, which is 700 per cent. When you start leading people, what you deliver as an individual matters less and less. It’s not about whether you to kill a presentation (ifml.)etw. sehr erfolgreich vortragenkilled the presentation. It’s about whether the plan you presented produced the projectedgeplantprojected results. OK, and what about opportunity or luck? Is luck really part of career development? Well, I think in many ways, modern concepts of leadership to perpetuate sth.etw. aufrechterhaltenperpetuate a myth of control, that we are masters of our own destinySchicksaldestiny. What is often not mentioned are the factors that are simply beyond our control. I have seen many capable and dedicatedengagiertdedicated people not reach their career goals. If you fail to analyse your situation correctly, you can easily end up applying your energy the wrong way. Part of career development is to make yourself ready for opportunity. Can people to cultivate sth.etw. pflegen; hier: entwickelncultivate opportunity? It’s a good question. Luck is like a butterfly that lands gently on your hand. You need to be ready for it, open, sensitiveeinfühlsam; hier: leicht reagierendsensitive to things that are to emergeauftreten, sich entwickelnemerging and to potential. This is not about goal-setting and targets. It’s about to sense sth.etw. erspürensensing and recognizing opportunity. What about relationships? The importance of these for career development is often underestimated, isn’t it? In general, yes, although this differs across cultures. I think in northern Europe, there’s a healthy disrespect for things like networking. 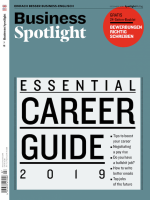 There is a belief in meritocracyLeistungsgesellschaftmeritocracy, and a suspicionArgwohn, Misstrauensuspicion about networking behind closed doors. But networking connects you to diverse talents. It connects you to new knowledge and insightEinblick, Erkenntnisinsights. Networking is not about joining a club of middle-aged white males smoking cigars, nor is it about being inauthentic, something we tend to be very concerned about in northern Europe. Rather, networking is simply a key way for you to deliver better results faster. If you ignore relationships in the career game, you have a lot of compensating to do — you have to be better and luckier, and you have to want it more. “Want it more” — that’s “enterprise” in your model, right? It means you get to the top only if you really fight for it. Right. Someone once said that, only if you don’t want it, can you become a good leader — that humilityBescheidenheithumility and lack of ego are the best qualifications. But that’s perhaps idealized. Would you really promote someone who doesn’t really want it, who hasn’t worked like hell (ifml. )hier: wie verrücktlike hell to get the position? I think desire matters. Many people are to be put off by sth.von etw. abgeschreckt seinput off by what they see as the “politicsPolitik; hier auch: Winkelzügepolitics” of senior managementFührungsebenesenior management. Does this reduce enterprise in those with potential? There’s a great movie, Lincoln, which looks at the abolitionAbschaffungabolition of slavery and shows how clearly Abraham Lincoln got there — sometimes by deceitTäuschung, Listdeceit, by lying, by very morally dubiousfragwürdigdubious means, but the higher purpose justified the means. And you know, organizations are large, with a massive variety of perspectives, huge complexity and multiple paradoxes. And sometimes, you need to be flexible in order to achieve your purpose. Those lower in the organization are possibly shelteredgeschütztsheltered from these realities, and maybe using the word “politics” is a way to avoid to engage with sth.sich auf etw. einlassenengaging with complex ethical challenges. Bo Graesborg’s book C(O)RE: The Boaching Guide to Career Success will be published in 2019. An extract is available at www.boaching.eu.